It was raced yesterday at Interlagos in Brazil the penultimate stage of this 2015 F1 world championship. Torcida was as always cheering, although the public in the stands was in sharp decline from last year, but there was very little to be happy. The two Brazilian drivers Massa and Nasr made a race completely anonymous and Massa, finished eighth, was later disqualified. Boring race and without any emphasis. We can only comment two episodes. The first concerns our Luigino Hamilton. After qualifying he was visually annoyed and he did not appear at the usual photos. Maybe because he did not get the pole or maybe for the interference of the federation in his private life following the accident that took in Monaco. We regret to see that a 3-time world champion falling to these children’s behavior that do little honor to the sport! This we believe is a behavior to be punished! The second has as protagonist Vettel. 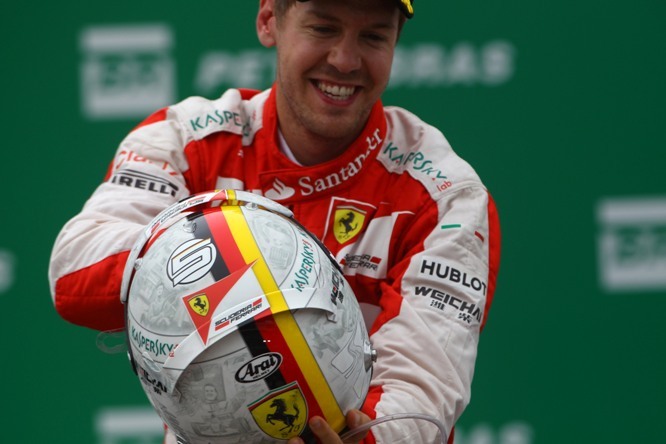 The new German of the ferrari with a fake and a shot worthy of Pelè dribbled a commissioner and managed to get on the podium holding his helmet to show everyone the symbol of Ferrari painted the back. Now, instead of wasting time to prevent the riders to celebrate as they see fit or carry flags on the podium or in the car, could we concentrate on the real damage image done by a pilot just graduated world champion who refuses to take a usual photos ??? Let us to do a final consideration. The journalists of sky at the end of the commentary praised Vettel and argued that all torcida sang his name Se-Se-ba ba……but to us, like many others viewers, it seemed that as every year the torcida sang Sen-na Sen-na….what do you think of? We do not understand why the Brazilian public would cheer the third arrived, the German driver of Ferrari, totally exclude the first arrived Rosberg or the second arrived the new world champion Hamilton. Perhaps did we heard and misunderstood?!?! Shameful the decision of Jean Todt, criticized also by Lauda, to join at the minute of silence already planned for the victims of the road that one to the massacre of Paris. Could not change program for one time and dedicate a minute of silence and with their billboard dedicated to the victims of imbecility and intolerance? Another missed opportunity to do the right thing for the image of this stale Formula 1!